Before I begin, let’s just get one thing out of the way: this is not a rant about how commercialized/meaningless Valentine’s Day has become. That argument has basically taken over Valentine’s Day, and there is so much discussion about it that I hardly think I need to chime in. Instead, my problem with Valentine’s Day lies with the fact that it focuses primarily on romantic love. John Green makes a great argument for this idea in one of his older videos, saying that Valentine’s Day should be about all kinds of love. What about friendship? Why isn’t that celebrated on Valentine’s Day? I certainly love my family and friends and I make a point of giving them all Valentine’s Day cards every year, but it seems like most people only concentrate on their special someone. How do you feel about Valentine’s Day? Let me know in the comments section below! I don’t like Valentine’s Day either. But mostly because of the commercialized/ meaningless category reasons. Anyway, if you want a day to celebrate non- Romantic (as in, that for friends and family) you have Esther Day. That day is specifically meant for telling the people you love that you love them. It is a thing in Nerdfighteria- mayne we should make it a thing with everyone! That’s a great point- Esther Day definitely needs to be more popular! Nerdfighteria has thought of everything haha 🙂 Thanks for commenting! 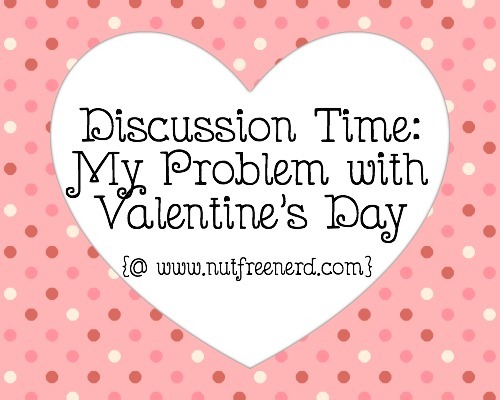 There are two reasons I don’t like Valentine’s Day, and both were mentioned in your post. The first reason, and the reason I didn’t care for it even as a small child, is that it seems so odd to me to have a day to remind you to love people. If you’re in a good relationship (be it with friends, family, or a significant other), why do you need a special day specifically for that? The second reason is one I really only thought about when I was older and had a better sense of economics, and it’s the over-commercialized nature of the event. If I were to take this a step further, it would be the fact that we’ve made a holiday supposed all about love out of the martyrdom of some guy who happened to be Christian hundreds of years ago. I’ve never understand the evolution. I agree with you! I think it’s important to focus on love outside the romantic sense.